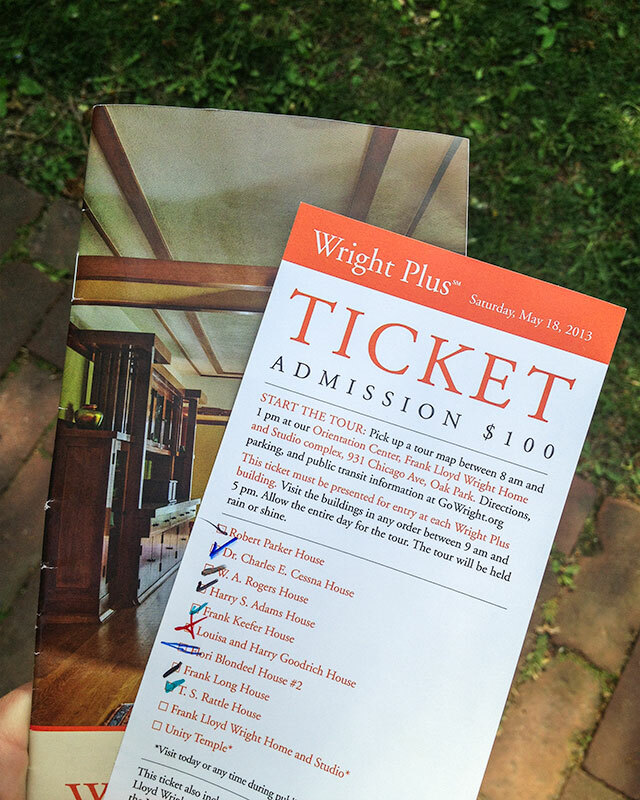 I went on the Wright Plus Housewalk here, in Oak Park, over the weekend. 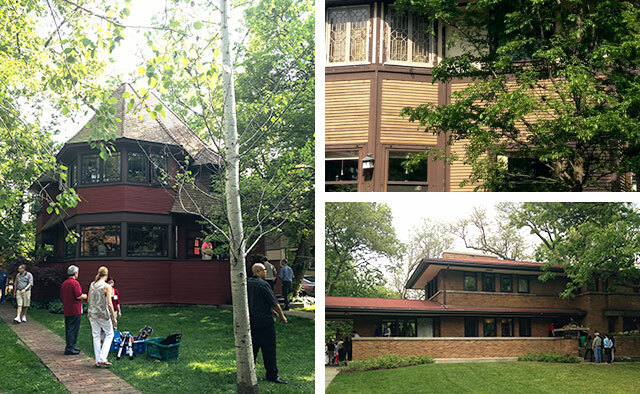 There were nine private residences on the walk, all built between 1885 and 1925, with three homes by Frank Lloyd Wright. 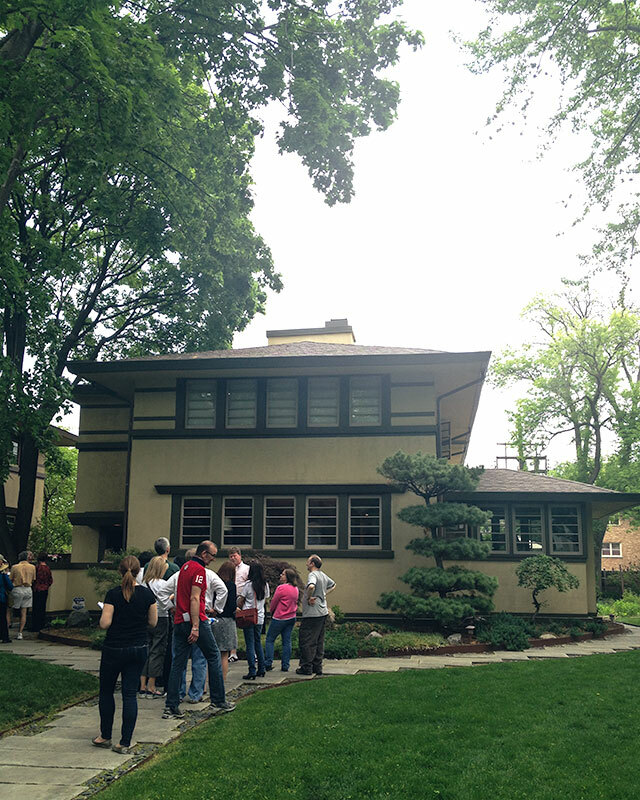 The tour also includes admission to the Frank Lloyd Wright Home and Studio, and Unity Temple. I just toured the home and studio recently, and I’ve been in Unity Temple before (our rehearsal dinner was held there! ), so I skipped those on the day of the Housewalk. Plus the ticket for the public spaces is good through the end of 2013, and also includes the Robie House and The Rookery. Interior photography was not allowed, so the only photo I can share is the one from the Cessna house (below), which was on the Housewalk’s site. 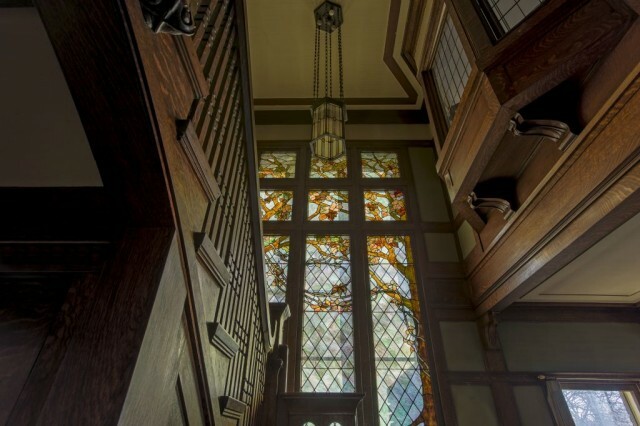 There was so much woodwork in the homes — lots of rift and quarter sawn oak. 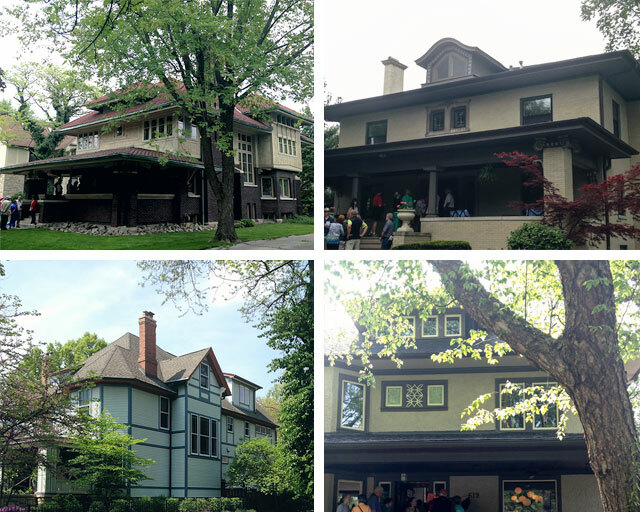 Next year, to mark the 40th annual Housewalk, the homes will be “All Wright.” Tourists visit Oak Park from around the world, and I imagine that the chance to tour eight private Frank Lloyd Wright homes will be a big lure. 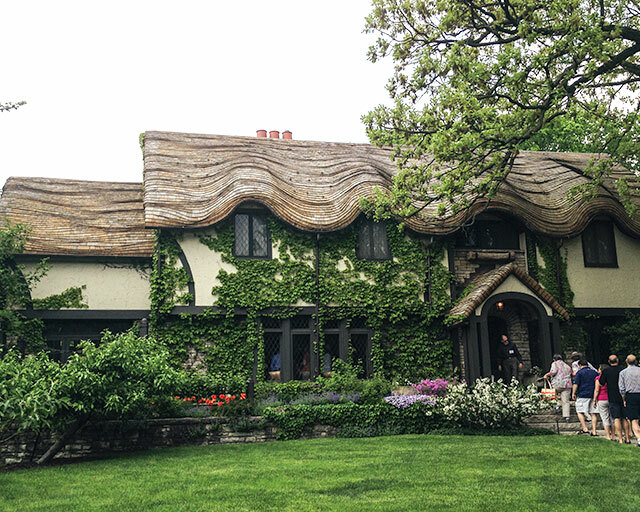 My favorite home on the tour was the Flori Blondeel House II, built in 1914, by John Van Bergen. An addition in 2005 doubled the home’s footprint and modernized it, while still keeping the original style of the house intact. Brandon grew up in the Frank Lloyd Wright Historic District of Oak Park, and after walking around the area all day, I was charmed. We like our side of town, but if we can find an affordable house in the historic district that will work for our family, we’ll go for it. The smaller/outdated homes do pop up occasionally. We’re not in a hurry to move, but I suppose we ought to start preparing our house so that we’ll be ready when the right house hits the market. Thanks for sharing this! Frank Lloyd Wright is one of my favorite architects but I never knew about this “Wright Walk.” Now I want to go next year! Suuper exciting, Nicole! We’re in Chicago and I can’t believe I still haven’t been to tour any of the Wright Homes. I love Oak Park. It’s really similar to the neighborhood in Chicago that I grew up in. That’s why we’re not in a hurry to move. 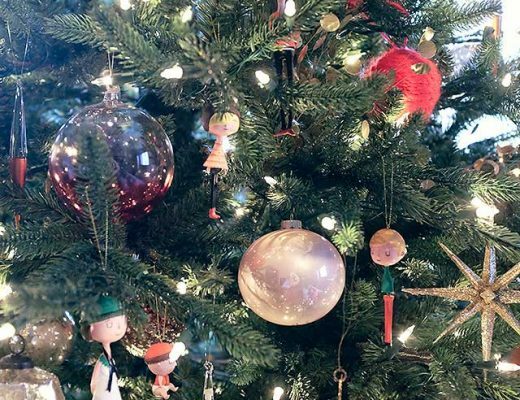 We really do love it, and yes, it has been the kids’ only home. But a new home would be a fun adventure! Finishing the last of the little projects was a nudge, and the Housewalk was a great big PUSH. Oh wow! I grew up in Oak Park, so recognize all of these houses, but a chance to tour the interiors would be such a treat! Looks like a great day. Ohhhh that looks so fun! If I ever visit Chicago I will have to take the tour for sure. If you’re ever in the DC area, the Pope-Leighey house in Alexandria is really cool to see- its only about 1000 square feet, and I loved seeing the FLW look & philosophy applied on a small scale. It’s a really beautiful and inspiring house! I definitely second the Pope-Leighy house which is right near Mount Vernon, so you could get a different historical perspective. Also, Kentuck Knob is very near FLW’s more famous SW PA home of Fallingwater. We visited Fallingwater a bit as kids in the area, but never knew about Kentuck Knob until my folks went back after we had moved. On our third date, my now-husband and I went on a tour of the FLW home and studio, so we have a great connection to that place. It must have been fate, because we were living in Chicago and Naperville at the time, and now we are Oak Parkers. That sounds like such a neat tour! Thanks, Eileen. I emailed you. Frank Lloyd Wright homes are so unique and beautiful. I’ve always wanted to go to Oak Park and see them. Maybe if you move there we can all see the neighborhood through your eyes. We’re already in Oak Park, but not on this side of town. Fingers crossed, we will be though. I would love to go on this tour. Did you happen to see a date for next year? Thanks! The tour will take place Saturday, May 14, 2014. Tickets are on sale here. So… if you volunteer for Wright Plus you get to participate in “preview night” where all the houses are open on Friday evening and there are no lines. It’s definitely a perk! Also, as someone who loves the idea of someday living in a big old house too, have you considered other neighborhoods like Riverside or certain parts of Berwyn? At least as a stepping stone. I moved from Oak Park to Berwyn a few years back and now am looking for the “next” place, but every house has been a learning experience. 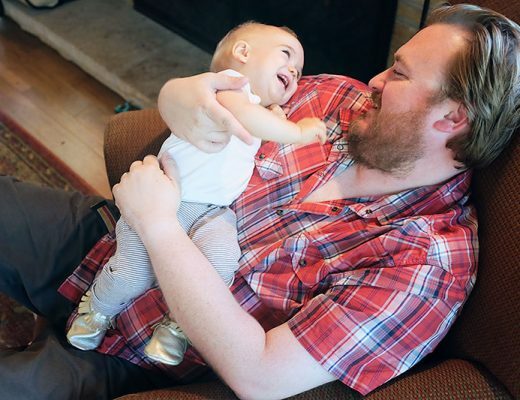 I like both Berwyn and Riverside, but our hearts are set on staying in Oak Park. And I noticed that you’re selling your place. Good luck! It looks gorgeous — someone will be lucky to get it. Totally understand. I love Oak Park too! I worked the Wright tour this year! I was stationed at the Long house or as many people called it the “clam shell roof house”. :) Love that I got to tour all the homes for free the night before too! I would love to see you do a post about potential houses you would buy and what you would do to change them, using real estate listing photos and a list of what you would add or subtract/mood boards. What a cool event! My husband and I visited Oak Park last summer when we were checking out Chicago and I thought it was such a picturesque suburb. We did the sculpture walk (I think it was called that?) in the historic area and I sort of wondered if I’d stumble across your house! I’m in California, but there are plenty of craftsman homes in my area (and my home has many details from that time too), so I’m always curious to see how you work with those features like wood trim, picture rails, etc. I can’t wait to see what you’ll do with a new home! I’m giggling at “I suppose we ought to start prepping our house.” Has a house ever been more prepped?! It’s gorgeous gorgeous gorgeous. If it hits the market, I’d consider buying it without ever stepping foot inside. Ha! I’ll admit, we’re probably in better shape than most. 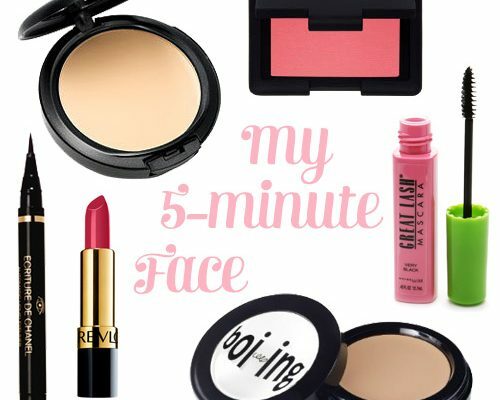 Still, there are plenty of things we can do to prepare (*cough* pink living room walls). This=awesome!! I’m from Toledo, OH and it looks like it’s almost making a weekend trip just for that tour! I was driving my kids around the day of the housewalk and totally spotted you out on the tour. Just came to this post via Pinterest- and I’m excited to read about your new adventure. We’re up in the NW corner and I love biking through the historic area on my way to work each day.